When it comes to sewing through leather, you’ll find that less expensive sewing machines won’t meet your expectations. Leather and thicker fabrics are a lot more difficult to penetrate with a standard machine. The thickness and a weaker motor make sewing through these materials an impossible challenge. 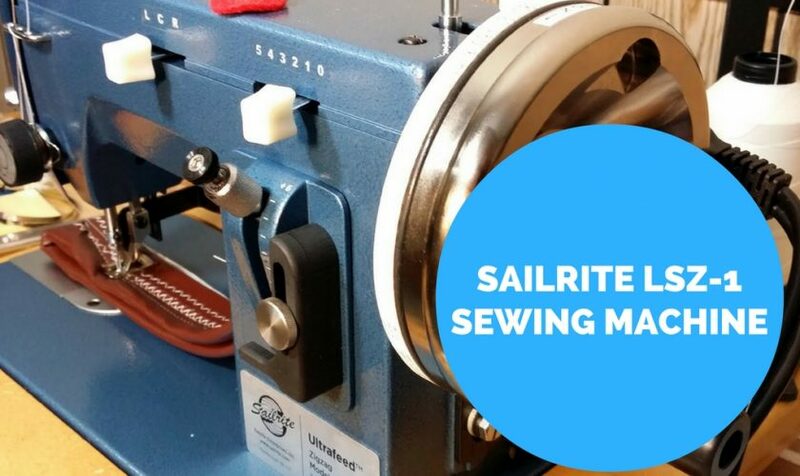 However, the Sailrite LSZ-1 is a rugged machine that aims to make sewing through thicker materials a breeze. This is a more expensive model (near $750), but it’s a small price to pay for the best sewing machine for leather and heavy materials. It’s definitely not a machine you’ll want to purchase to teach a child how to sew, but it is a machine that advanced seamstresses will choose over the competition. We’re going to take a look at what it takes to be a robust sewing machine that’s able to work with thick fabric in our review of the Sailrite Heavy Duty LSZ-1 sewing machine. When you look at a machine of this magnitude, you’ll often glance over the features and be left scratching your head. Where are all of stitches? Where is the fancy selection system? Well, these features are nice, but they’re not truly necessary for thicker fabrics. The problem is that heavy-duty machines aim to do one thing well: go through thicker fabrics with ease. And while a hundred stitch options seems nice, this doesn’t mean that they’re going to be used often. 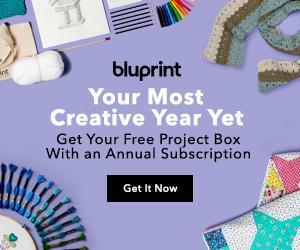 In truth, these stitches are used so infrequently that many people won’t use more than 4 – 5 stitches during the lifetime of the sewing machine. The sparse projects that require these stitches doesn’t justify a heavy-duty model offering them. There is also the consideration that only certain stitches will be able to hold thick fabric together. So, don’t let the lack of fancy features deter you from this machine – it offers everything a seamstress needs to sew thick garments. We trust that if you’re looking at this machine, your main purchase will be to sew through thick fabric and leather. When you use this machine, you’ll be confident that you’ll be able to handle these heavy-duty projects. 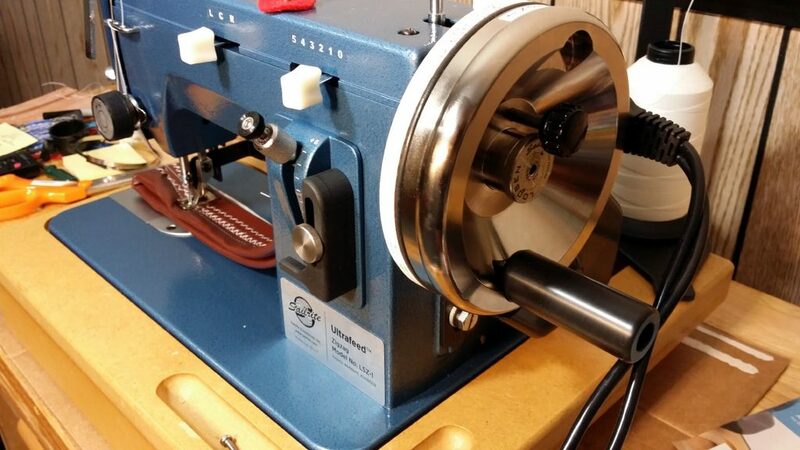 If you want to sew through upholstery fabrics, you’ll be able to do this, too, with the LSZ-1. All of this is done with an enhanced motor and power system. There are two things you need when sewing layered fabrics: power and precision. A weak motor will not be able to make its way through denim or leather without either breaking the needle or causing the engine to whine in the process. Power Balance Plus Wheel: The traditional flywheel cannot compete with the Power Balance. 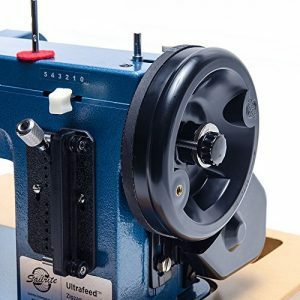 This wheel offers the same small size as a traditional flywheel while supplying double the power to ensure the needle always makes it through the fabric with ease. Posi-Pin Clutching System: The clutching system is vital to your machine’s operation, and this system is responsible for ensuring 100% power transfer when the machine is in use. The transfer occurs between the flywheel and needle. The Power Balance and Posi-Pin work in unison to deliver the utmost in power to the needle with little-to-no power loss during the transition. Smooth and fluid, the LSZ-1 effortlessly works its way through fabric with ease. If you ask older people what they miss most about the 50s and 60s, they’ll often mention how products were designed to last a long time. Cheap plastic has caused many of the sewing machines on the market to be susceptible to breaking. But the Ultrafeed LSZ-1 is different. From the moment you pick up this sewing machine, you’ll realize that it’s very heavy, which is a consequence of its steel design. All of the parts and exterior are made out of steel, and when we tried looking for plastic pieces, we only found a knob that was made from plastic. Customer service is also very responsive, and they try to resolve issues with the greatest ease. If there is one thing that really makes this company stand out from the competition, it’s definitely their customer service. The company cares about their customers and the sewing machines they manufacture, so if you have a problem with your machine, rest assured that it will be handled with the utmost professionalism. If the price is too high for your budget, we fully understand. This is a high-end model, and not everyone will be able to shell out the money for this machine. A good alternative, and one that we highly recommend, is the Janome HD3000. The HD3000 is also a heavy-duty sewing machine, and it comes with a few advanced features, such as 18 stitches and a built-in needle threader. This model may not offer the same durability as the LSZ-1, but it is able to sew through thick fabrics, including leather. If you’re looking for a mid-priced, heavy-duty sewing machine, the Janome HD3000 is a great choice. Click here to learn more about the Janome HD3000. The only real “con” I found was that this sewing machine is heavy. The machine itself must weigh at least 35 pounds, so it’s anything but portable. This will remind you of the quality of the steel machines that you likely saw your grandmother using decades ago. This industrial sewing machine was built to handle anything you throw at it. We think we found one knob on the whole machine that was plastic. Even if you wanted to, you wouldn’t be able to break this machine without some hefty dynamite by your side. It’s completely solid, and there is very minimal maintenance required to keep this model running smoothly. If you sew through thicker fabrics, it’s time to choose the best sewer for thick fabric. => Click here to buy the Sailrite Heavy Duty Ultrafeed LSZ-1 Sewing Machine.